Although the sprawl of reference — the calligrapher’s omnivorous cultural appetite — amplifies the zest of the imagery and our pleasure in it, the work can hardly help but raise questions regarding the medium itself. Such rampant inclusiveness speaks, yes, to the integrative possibilities of modern culture, a time when cultural exchange is more available than ever before: but what happens when this occurs in fact? Is it more than cultural tourism, or less? 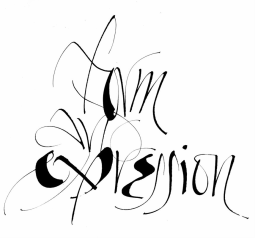 Of even greater importance, perhaps, is the positioning of calligraphy itself, this quiet art in the midst of a noisy age. 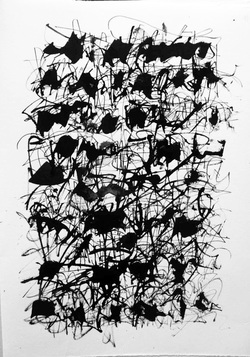 Ingmire has striven to overcome the reticence and poise of the conventional medium, to invest it with the boldness of contemporary art practice, though we must recall, too, that calligraphy is itself a technology, one whose rise in the West occurred in conjunction with early book production — a sophisticated, intensely creative handcraft, but antiquated in every way. Is it another instance of historical obsolescence we face here, like smithery or quilting, whose survival in the present day is deliberate and self-conscious, feeding another kind of tourism, that of nostalgia? Or can it intervene in contemporary life, and so make a stand against the ruthless normative drives of modern printing technologies as they continue their headlong plunge into an electronic future in which language itself will be merely light on a screen, weightless, evanescent, homogenized?